I pulled off my sleeping mask and winced at the bloodshot eyes glaring back-at me from the screen of my forward-facing phone camera. I hadn’t slept properly since arriving in Amsterdam the week before, and the closest I’d got to any form of proper kip in the past two days had been the 5 hours curled-up on the concrete departures entrance of Rome Airport during my layover from Schiphol. Nevertheless I had a new city to discover, and whilst on the road take pride in squeezing out every second of my time, never knowing when I might return to a certain destination or place, or if ever. 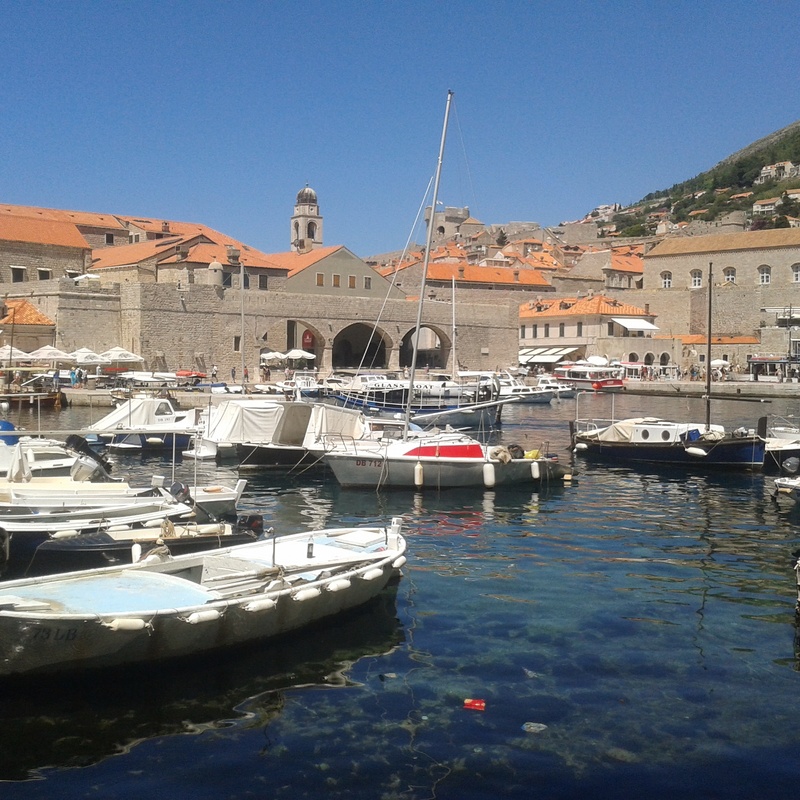 The half-hour local airport shuttle-bus dropped us off at Pile Gate, the Western entrance to Dubrovnik’s Old Town; a UNESCO World Heritage Site fortressed by a 2km long – 25m high- walled system of turrets and towers built to protect against enemy attack from the Adriatic Sea. According to my hostel direction however I was not to enter through the grandiose drawbridge that stood magnificently before me, but through the Buza gate to the north; Buza literally translating to ‘hole’ in the wall. Having entered, I was then to take the first street on my right until I passed a restaurant called Lady Pi-Pi, apparently noticeable from a distinct fountain in the courtyard. Trundling my suitcase over the cobbled street, the purpose of my visit to Amsterdam not allowing the luxury of a backpack, I reached what was unmistakably the stone sculpture in question and was immediately transported back to my time in Brussels. During what was, let’s say, an ‘unconventional’ tour, my friend Bjorn had shown me not only the world famous Manekken Pis, but also the lesser known statue of the Jeanekken Pis, a sister to the ‘Little Pee Boy’ that is hidden down an alleyway just round the corner. Now, here in Dubrovnik, I was faced with the Croatian equivalent as the carving of a woman sitting spread-eagled shot a jet of water out from her nether regions into the basin at my feet. I wondered whether the locals would also be so forthcoming with their welcomes… or if the tap water was safe to drink at that? Check-in wasn’t until 2pm but the girl cleaning the place was kind enough to let me store my bags and use the facilities. Feeling less burdened and slightly refreshed, although no less tired, I pulled on a pair of shorts and headed down to Stratum, the Old Town’s main thoroughfare where, despite the early hour, hundreds of tourists were already crowding though the entrance on a seemingly endless conveyor belt of walking tours. Now this hasn’t been factually verified, but I would guess that is how Pile Gate first got its name… from the vast amount of people trying to ‘pile’ through the narrow entrance at once. 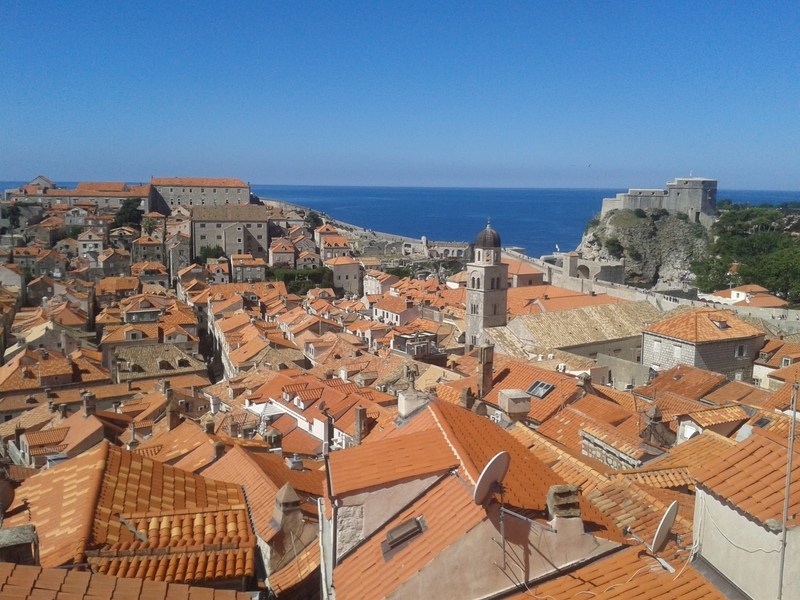 In recent years, thanks to certain film scouts, Dubrovnik’s main selling point has switched from that of a city with great historical relevance to one that serves as a premier filming location for the HBO series Game of Thrones. As the temperature creeped its way into the thirties I scanned the groups being led around the fictional TV capital of Westeros, and in a bout of oblivious irony noticed that many of the people now vigorously applying sun cream were also sporting merchandise t-shirts bearing the famous Season 1 quote: “Brace Yourselves, Winter Is Coming.” I crossed my fingers in the hope that the Croatian weather wasn’t as erratic as these fans were making out. My first port of call was to circumnavigate The Walls, and paying the 100 Kuna (€15) restoration entrance fee I marched up the steep stone steps to the most remarkable view. Every last morsel of space had been squeezed from the Old Town, which is completely prevented from expanding by the towering barricades of human architecture upon which I now stood. Dodging selfie-sticks like I were Neo in The Matrix I strolled round, simultaneously taking in the sheer vertical cliffs of the Dalmatian Coastline to my right and the hustle and bustle of daily life on my left. At some points I could even see directly into people’s living rooms; the locals getting on with their breakfast preparations and laundry chores clearly numb to the flow of gaping tourists past their wide-open windows. It took about an hour to traverse the length of the course and as I descended back to ground level, swapping the glorious sea breeze for the naturally baking cauldron below, the faint sound of what seemed to be the Game of Thrones theme tune became crisply louder. 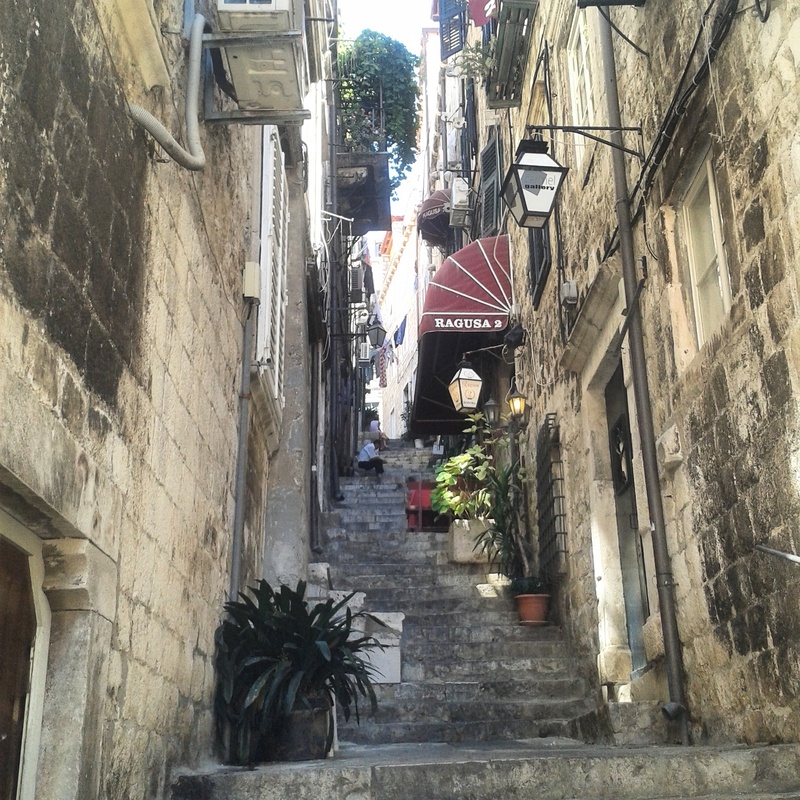 At the base of the stairs sat a busker dressed head-to-toe in traditional Croatian garments and playing the soundtrack on repeat from a little hand-carved violin as revelers dumped coins into his up-turned hat. He may as well have had a license to print money. Grabbing some lunch in the marina whilst watching the boats enter and exit the harbor to and from their various excursions, I then settled down in an Irish Pub to catch some of the morning’s Wimbledon coverage. I’ve come to the realization whilst travelling that it is easier to locate an Irish Pub in a foreign city that it is a McDonalds or Starbucks, and that each and every one of them claims 100% authenticity. At least this one served Guinness I suppose, and that is the first test. When 2pm hit I headed back up the mountain of stairs to the hostel, where upon checking in I immediately crashed out; the heat of the blazing mid-day sun being kept at bay by the gloriously air-conditioned cool-box of a dorm.